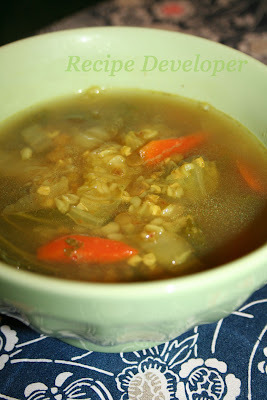 I have been using buckwheat groats a lot lately. For me, I am making a soup, and for my husband, it's oatmeal. These are the photos for the soup I made the other day, first one is curry flavored vegetable ( onion, cabbage, carrots ) soup with buckwheat groats. 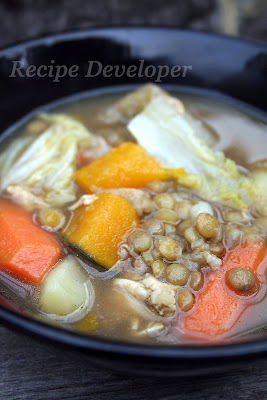 Secand one is chichen, lentils, buckwheat groats and vegetable ( napa cabbage, carrots, pumpkin, potatos ) soup. This is my husband's favorite oatmeal bowl lately. Cook buckwheat and rolled oats in the water first, and then add some milk, fruits, and brown suger. This is great easy breakfast. But! 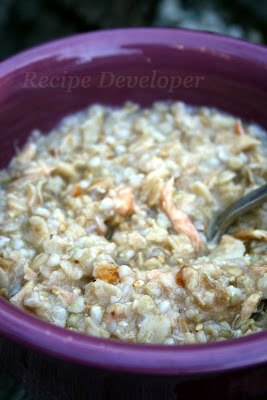 I love to eat oatmeal little Japanese style :) I cooked rolled oats and buckwheat in Japanese "DASHI" broth, and add cooked salmon, little salt, bonito flakes, and sesame seeds. Here you go! 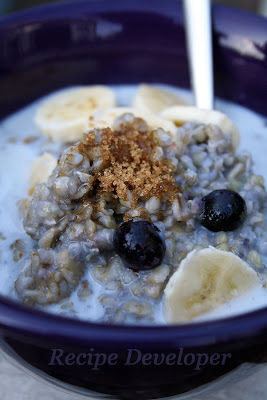 "Japanese style oatmeal"